Vandaag waren Erik en ik bij de boekpresentatie van Bas van den Hurk in De Pont. Bij deze presentatie was ook een gesprek, en een manifest dat besproken werd. Continu werd in deze gesprekken de tekst van Joselit naar boven gehaald. Deze hebben we al eens kort aangehaald bij een vorige tentoonstelling van Bas van den Hurk. Nu dus de hele tekst, met afbeeldingen (in kleur zelf, dat mocht blijkbaar niet bij de originele publicatie in October). De afbeeldingen staan op dezelfde plaats als in de tekst. Het is een redelijk korte maar erg interessante tekst. Leesvoer voor de komende week dus. With a characteristic flourish of perversity linking painting to pasta, Martin Kippenberger identified the most important problem to be addressed on canvas since Warhol in an interview of 1990–91: “Simply to hang a painting on the wall and say that it’s art is dreadful. The whole network is important! Even spaghettini . . . . When you say art, then everything possible belongs to it. In a gallery that is also the floor, the architecture, the color of the walls.”1 If we take Kippenberger at his word, a significant question arises: How does painting belong to a network? This late twentieth-century problem, whose relevance has only increased with the ubiquity of digital networks, joins a sequence of modernist questions: How does painting signify in the semiotic aporias of Cubism or the non-objective utopias of the historical avant-gardes? How can the status of painting as matter be made explicit (i.e., through the incorporation of readymades, and the rise of the monochrome and seriality as well as the gestural techniques of dripping, pouring, and staining)? 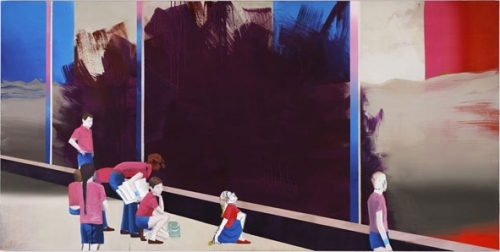 And How might painting meet the challenge of mechanical reproduction (as in strategies of appropriation spanning Pop’s silk screens of the 1960s and the Pictures generation’s return to painting in the 1980s)? None of these problems exists in isolation or ever disappears; instead, there are shifts in emphasis in which earlier questions are reformulated through newer ones. Certainly, painting has always belonged to networks of distribution and exhibition, but Kippenberger claims something more: that, by the early 1990s, an individual painting should explicitly visualize such networks. And indeed, Kippenberger’s studio assistants and close associates (some might call them collaborators)— such as Michael Krebber, Merlin Carpenter, and his interviewer of 1990–91, Jutta Koether—have developed practices in which painting sutures a virtual world of images onto an actual network composed of human actors, allowing neither aspect to eclipse the other. 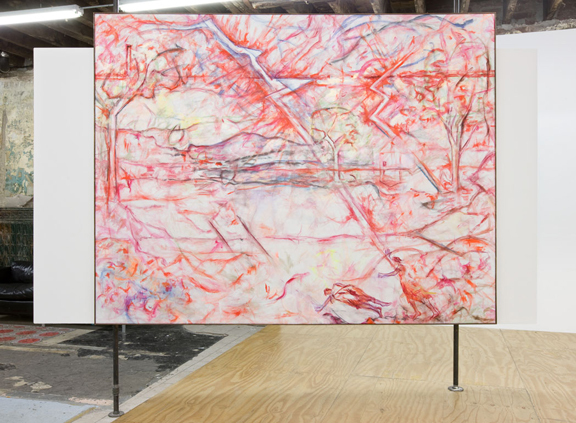 In Koether’s 2009 exhibition Lux Interior at Reena Spaulings Gallery in New York, for instance, painting functioned as a cynosure of performance, installation, and painted canvas. 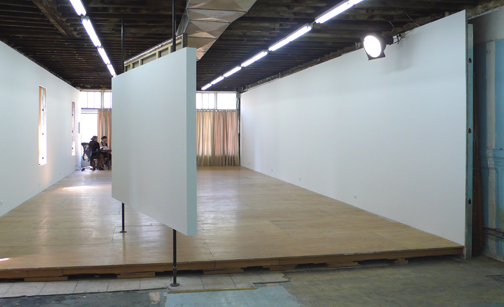 The exhibition centered on a single work mounted on an angled floating wall—much like a screen—which, as Koether put it, had one foot on and one foot off the raised platform that delineates the gallery’s exhibition area, as though caught in the act of stepping onstage.2 This effect was enhanced by a vintage scoop light trained on the painting that had been salvaged from The Saint, a famous gay nightclub that officially closed in 1988 largely as a consequence of the AIDS crisis. The canvas itself, Hot Rod (after Poussin) (2009), is a nearly monochromatic reworking of Poussin’s Landscape with Pyramus and Thisbe (1651), representing a Roman myth centered on the extinction of love—and life—caused by the misreading of visual cues (Pyramus sees Thisbe’s ruined veil and assumes she has been murdered by a lioness, leading to his suicide, and then, upon finding him dead, Thisbe’s own). Lux Interior offered a sophisticated response to the question with which I began: How does painting belong to a network? It’s worth pausing to consider how difficult it is to visualize networks, which, in their incomprehensible scale, ranging from the impossibly small microchip to the impossibly vast global Internet, truly embody the contemporary sublime. One need only Google “Internet maps” to turn up Star Trek–inspired images of interconnected solar systems that do little to enhance one’s understanding of the traffic in information but do much to tie digital worlds to ancient traditions of stargazing. Koether approaches the problem in a different way. Instead of attempting to visualize the overall contours of a network, she actualizes the behavior of objects within networks by demonstrating what I would like to call their transitivity. The Oxford English Dictionary gives one definition of “transitive” as “expressing an action which passes over to an object.” I can think of no better term to capture the status of objects within networks-—which are defined by their circulation from place to place and their subsequent translation into new contexts-—than this notion of passage.5 In Lux Interior, Koether established such transitivity along two axes. First, each brushstroke of her reenactment of Poussin’s Landscape with Pyramus and Thisbe embodies the passage of time. This diachronic axis of painting-as-medium is joined to a second synchronic kind of passage which moves out from painting-ascultural artifact to the social networks surrounding it, as indicated both by Hot Rod’s behavior as a personage (it “steps” on stage, is lighted by disco lamps, etc.) as well as the artist’s performance as the painting’s discursive and bodily interlocutor in her three lecture events. 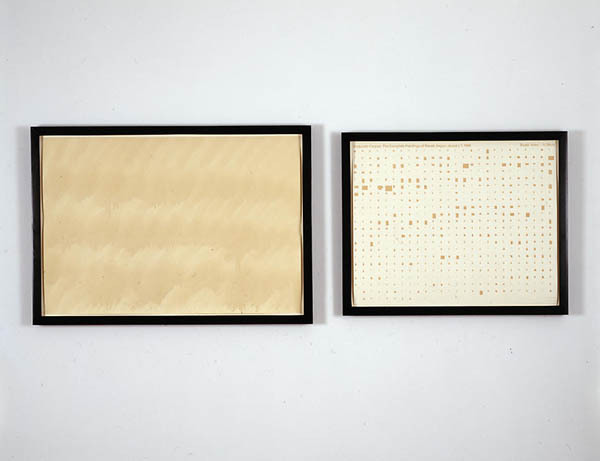 What defines transitive painting, of which Koether represents only one “mood,” is its capacity to hold in suspension the passages internal to a canvas, and those external to it. In this regard, painting since the 1990s has folded into itself so-called “institutional critique” without falling into the modernist trap of negation, where works on canvas are repeatedly reduced to degree zero while remaining unique objects of contemplation and market speculation. From this cooler perspective, Stephen Prina stands in a position analogous to Kippenberger vis-a-vis younger artists such as Cheyney Thompson, Wade Guyton, and R. H.
Thompson, optical sensation was linked to the history of painting’s conventional formats; for Guyton, it was tied to the mutability of digital information; and for Quaytman, it alluded to the ethically charged legacy of gentrification by artists and galleries on the Lower East Side of New York. might seize the entire oeuvre of Manet. I have argued elsewhere that Dada’s diagrammatic drawings, particularly those of Francis Picabia, disrupt the representation of stable objects, and by extension, the stasis of reification.11 Indeed, if we recall the definition of transitivity I introduced above—“expressing an action which passes over to an object”—a close relationship between the transitive and the diagrammatic might be anticipated, since diagrams are entirely devoted to accommodating passages from one element to another. 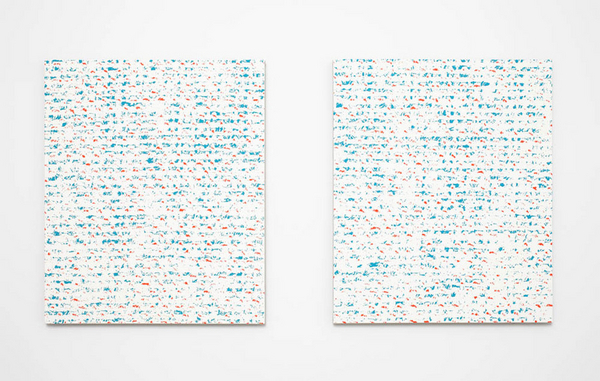 Indeed, recent practices of transitive painting are complemented by a contemporaneous engagement with the diagram. 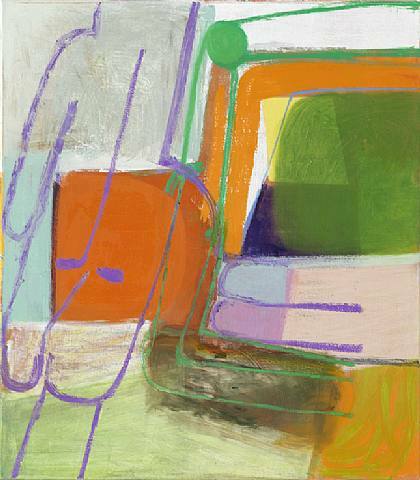 In paintings by Amy Sillman and Thomas Eggerer, to name only two of many possible examples, a fig urative element (in Sillman’s case this is usually a drawing by her own hand and in Eggerer’s, a photographic motif taken from a magazine or book) is submerged in a field of gestural vectors. Whether in a ludic, or a despairing mood, figuration is partially digested into pure passage. A fragment obtrudes here and there, just to remind us of the enormity of those procedures of abstraction that also characterize the digital network’s translation of cultural artifacts into code. Transitivity is a form of translation: when it enters into networks, the body of painting is submitted to infinite dislocations, fragmentations, and degradations. As Kippenberger suggested nearly twenty years ago, these framing conditions cannot be quarantined. (Los Angeles: The Museum of Contemporary Art; Cambridge: MIT Press, 2008), p. 316. 4. Music is a fundamental dimension of Koether’s practice as an artist. Lux Interior, for instance is named after the front man of the punk band The Cramps, whose lyrics are featured in the archive compiled by Koether of various “source materials” that accompanied the exhibition. 5. Given Marcel Duchamp’s fascination with passage within painting, not only in works such as Passage from Virgin to Bride (1912) but in The Large Glass (1915–23) and even through the peregrinations of the readymades over their “lives” this seems a good moment to acknowledge the importance of Dada painting to the contemporary development I am sketching out. Whether the influence is direct or not, and I’m somewhat doubtful it is, both Dada and so-called neo-Dada artists were exploring how painting might embrace networks beyond itself. For example, see George Baker, The Artwork Caught by the Tail: Francis Picabia and Dada in Paris (Cambridge, Mass. : MIT Press, 2007), especially chapter 2, “The Artwork Caught by the Tail: Dada Painting”; and Branden W. Joseph, Random Order: Robert Rauschenberg and the Neo-Avant- Garde (Cambridge, Mass. : MIT Press, 2003). Thierry de Duve has of course written importantly on the relationship between Duchamp’s painting and the readymade. These ideas are collected in Kant After Duchamp (Cambridge, Mass. : MIT Press, 1996). In my own Infinite Regress: Marcel Duchamp 1910–1941 (Cambridge, Mass. : MIT Press, 1998) I address the question of Duchamp’s painting in different ways. 6. Elisabeth Sussman and David Joselit, “Stephen Prina” in David A. Ross and Jürgen Harten, The BiNational: American Art of the Late ’80s (Boston: The Institute of Contemporary Art and Museum of Fine Arts; Köln: DuMont Buchverlag, 1988), p. 158. 7. 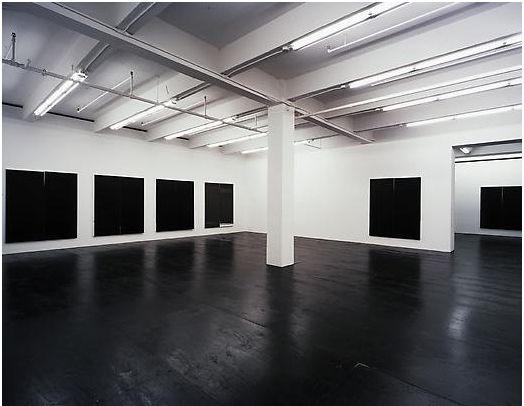 Prina made a related project in 1988–89 titled Monochrome Painting that included his own “reenactments” of the formats of monochromes drawn from various significant twentieth-century artists, arranged as stations of the cross (in homage to Barnett Newman). 8. Sussman and Joselit, “Stephen Prina,” p. 157. 9. For an excellent account of Guyton’s work, see Johanna Burton, “Rites of Silence: On the Art of Wade Guyton,” Artforum XLVI, no. 10 (Summer 2008), pp. 364–73, 464. 10. 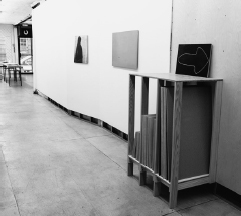 I give a fuller discussion of Quaytman’s piece in my “Institutional Responsibility: The Short Life of Orchard,” Grey Room 35 (Spring 2009), pp. 108–15. 11. See my “Dada’s Diagrams,” in The Dada Seminars, ed. Leah Dickerman, with Matthew S. Witkovsky (Washington: The National Gallery of Art; New York: D.A.P., 2005), pp. 221–39. Benjamin H. D. Buchloh develops a more disciplinary understanding of the diagrammatic in his “Hesse’s Endgame: Facing the Diagram,” in Eva Hesse Drawing, ed., Catherine de Zegher (New York: The Drawing Center; New Haven: Yale University Press, 2006), pp. 117–50. OCTOBER 130, Fall 2009, pp. 125–134. © 2009 October Magazine, Ltd. and Massachusetts Institute of Technology.